After a brief break from our big baking adventure (the girls have been very busy the past couple of weekends), Ella and I are back in the kitchen. This weekend we made cupcakes. I found a recipe from Robyn on her add a pinch blog for The Best White Cake Recipe. We decided to try the recipe but make cupcakes instead of cake. And are we glad we did! The cupcakes are amazing. 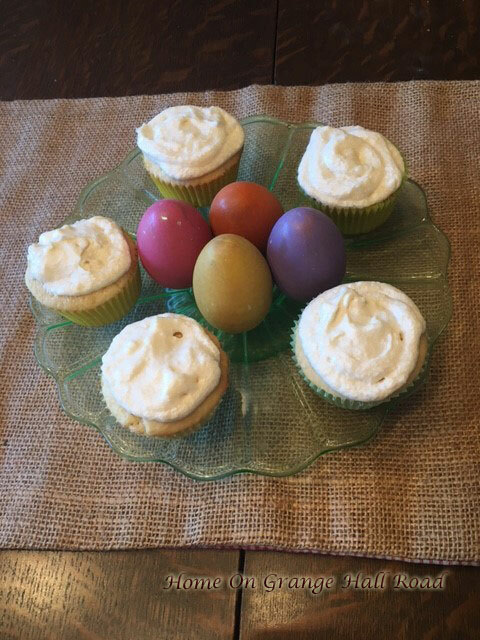 Ella and I both agree that this is the best white cupcake recipe ever!! Place cupcake liners in muffin tins. Spray lightly with cooking spray. Makes approximately 24 cupcakes when cupcake liner is filled to ¾ full. Or approximately 36 cupcakes when filled ½ full. Bake 18 – 20 minutes. Remove from oven and let cool completely on wire rack. Place softened butter into the bowl of a stand mixer that has been fitted with the paddle attachment. Turn the mixer on a medium setting and cream the butter until it is smooth and has lightened in color, about 3 minutes. Add confectioner’s sugar, ½ a cup at a time. After each cup has been incorporated, turn the mixer onto the highest speed setting for about 10 seconds to lighten the frosting. Add milk, heavy cream or half-and-half until the frosting has reached the preferred consistency. For a firmer frosting, add more confectioner’s sugar, a ¼ cup at a time. For a softer frosting, add more milk or cream, a tablespoon at a time. And here are the amazing cupcakes! I am anxious to try this recipe again. It is very good, very interesting, and I really like it. I encourage you to give it a try. Spring is certainly in the air. Time sprung ahead this weekend. I have seen dozens of robins and all the birds are singing happily in the morning. Which means that flowers are soon to be the center of my attention!!! I will be ordering all my seeds this week!!!!! WHERE, OH WHERE, IS SPRING?